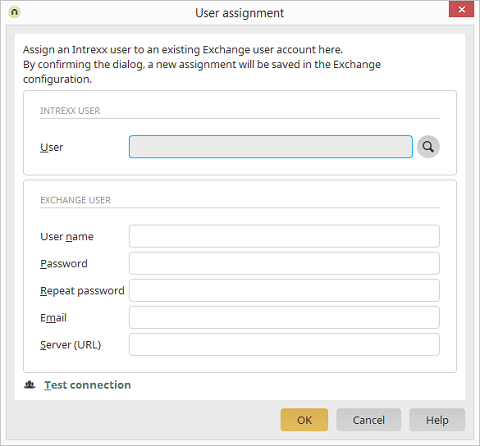 As well as being able to access the personal mailbox the Connector for Microsoft Exchange also makes it possible to configure an application for access with a specifically defined user. This faciliates, for example, convenient access to information mailboxes or group calendars. In order that these users can access data in the mailboxes of other users, they must possess the corresponding permissions in Exchange. The path and user name of the currently selected user is shown here. Opens a dialog where the desired user can be selected from the Intrexx User Manager. Enter the user name of the Exchange user. Here, enter the email address of the Exchange user. Enter the URL of the Exchange server here. Using this link, you have the ability to test your connection.